The new U2 visitor centre “will make the Dublin’s Docklands and Grand Canal Dock a destination experience for the millions of U2 fans around the world”. That is the claim contained in planning documents lodged with Dublin City Council that give a sneak preview of what the band is planning for the Hanover Quay site. The four-storey building – with a total floor area of 2,864 sq m – will include a reconstruction of the band’s original studio and various themed exhibit areas that include a series of abstract scenes such as ‘the Music Room’ and ‘Larry’s Kitchen’. The application by Golden Brook Ltd and MHEC Ltd also includes a cafe, auditorium, reception and area for selling merchandising. According to Manahan Town Planners, the visitor centre “will contain exhibit spaces, which will house memorabilia from U2’s vast musical history including old guitars, performance outfits and paraphernalia from their past”. 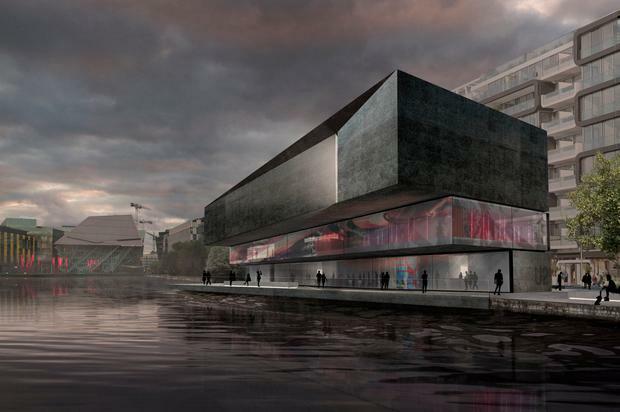 The project’s Dublin-based architects, ODAA, plan to install a removable pontoon so that fans can access and exit the building on the waterside. The planners state that it is proposed to demolish the buildings on site and create “a world-class tourist attraction featuring a permanent, yet constantly evolving, exhibition of the U2 story on the site they recorded six albums”. The application has already attracted support from the Irish Tourism and Industry Confederation and the Intercontinental Hotel in Dublin, but not everyone is a fan. Local resident Niamh O’Shea told the City Council that the proposal “is something I strongly object to. This part of Hanover Quay is narrow and residential. “The creation of another tourist attraction in the area would put major pressure on the road facilities and disturb the enjoyment of people’s homes,” she added.